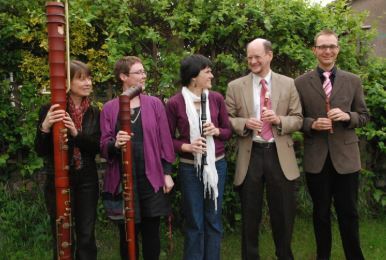 Join the Pink Noise Recorder Quartet for a free summery lunchtime recital of recorder music old and new including jazz, baroque and contemporary pieces. Pink Noise Recorder Quartet play a wide repertoire of music, with a particular focus on modern recorder music. Since 2008 the group has performed regularly in the Bristol area, gaining a reputation for tight ensemble playing and an ability to thrill an audience with great music. Concert starts at 1.30pm on Friday 31st August 2018. Lunchtime recitals take place in the chapel on Fridays after communion. All are welcome. Recitals are free with retiring collection. Steve Walter, following a concert in the Victoria Rooms, Bristol. Since moving to Bristol in 1991, Ellen has become Chair of the Bristol Branch of the Society of Recorder Players, and plays in the Clifton Viol Consort, Pink Noise Recorder Consort, Bristowe Consort and Blockflute Band. She has previously performed with Rosafresca. Ellen teaches Classics at the University of Bristol. Jen first picked up a recorder when she was six. 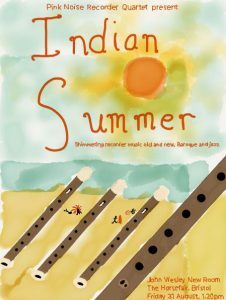 What started off as a great way to avoid having to sit in class for the last lesson of the afternoon turned into a lifelong passion for the instrument and its music, especially the modern repertoire. She studied with Miggs Coggan, composer Mike Irik and composer/player Zana Clarke (of early music group Cantigas and head of Australian publishers Orpheus Music), and attained her Associate Diploma in 1990. Jen teaches Alexander Technique privately, and is Alexander Technique tutor at Royal Welsh College of Music and Drama, Cardiff. Tim started playing the recorder as a child when he was given a recorder and tutor to keep him occupied for an afternoon. He was taught by Malcolm Davies. He also has served as chair of the Bristol Branch of the Society of Recorder players. Tim works in high-performance computing, currently for NVIDIA. Originally from Suffolk, Ben studied with the renowned recorder player and teacher Evelyn Nallen while training to be a primary school teacher in Cambridge. Following a move to Bristol, Ben joined Pink Noise in 2012, changing us from a quartet to a quintet. He also performs with Baroque and Beyond and has appeared as a guest player with Rosafresca. Ben is also a keen violinist and a former Trustee of the British Kodály Academy. He currently works as an early years teacher in Bristol.